Hi there.... This is Wednesday and I'm usually posting a Diedrich Dare card - which I really enjoy doing. However, I'm taking a break from posting for a couple months. We've decided to put our house on the market and sell our house. We've been in our home for 12 years, and we're busting at the seams. (It's a ranch with no basement). So, with the mortage rates being low, it's the right time to move. I'm in the "Get the house ready to sell" mode, not the design team mode. I'm taking a temporary break, and hope to sell our house quickly and be in a bigger home where we can spread out and I'll have LOTS of room to stamp. I can hardly WAIT! So...until I'm back into the posting mode, have a wonderful winter and spring...and I'll be back!!! Hi Everyone...Happy Wednesday. I'm happy today because I'm feeling better. Last week I had the flu - which I don't recommend, by the way. Thus, I didn't participate in the challenge last week. 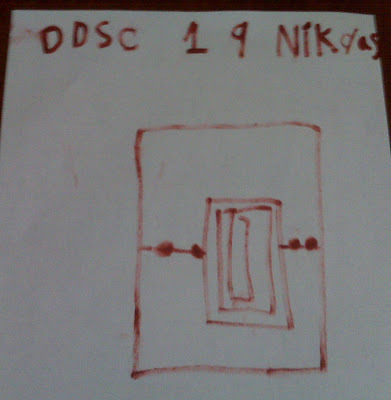 So...this week we have a great sketch by 7 year old Nikolas. I figured I'd use a new Stampin' Up! set called "Something Sweet" and use some goldfish, since most kids like Goldfish crackers. And I'm always needing kid's birthday cards with lot of nieces and nephews. The colors are Chocolate Chip and Crushed Curry. I had fun with my Big Shot machine and embossing templates. I love adding texture to my cards. Hi everyone - greetings from the COLD midwest. I'm ready for spring! 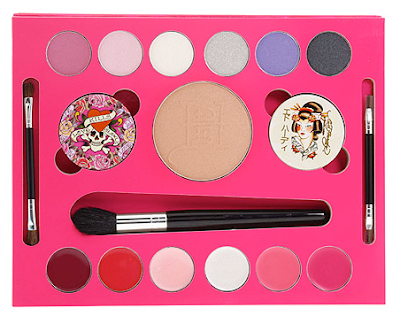 (Guess I'll have to wait though...) But these bright colors are fun anyway...this make-up kit is our source of inspiration this week. Fun idea, Madelynn! Here is my card. Kaite Cotton, over at http://www.papermakeup.com/ has generously donated the digital images for our challenge this week, (Thanks Katie!) so we incorporated the bright fun colors of this make-up kit with the wonderful digital images...and Waa Laa...instant card! Also, starting this year we have sponsers and prizes the first week of each month. The sponser for this month is Katie Cotton over at www.Papermakeup.com. Head on over to the the Whimsical Wednesdays blog to find out all the details, and to play along. You can link your card on Mr. Linky there at Whimsical Wednesdays blog, so we'll know where to find your card. I've had fun with the Easel Cards the past couple months - as you can tell. I used one of the new "In Colors" from Stampin' Up! - Melon Mambo. And I've also learned firsthand that using blender pens and watercolor pencils on images printed on my printer isn't a good idea - it blends all together when I color it. (UGH!) Also, you can't tell by this picture, but the cute little fairy has Dazzling Diamonds glitter on her wings so she's nice and sparkly in real life. Hey everybody...Happy New Year! I hope you are all enjoying a wonderful holiday season. 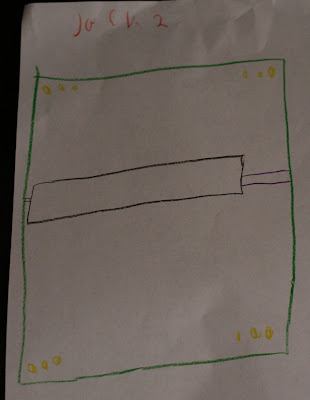 We had a break last week from our weekly challenge, and we're back this week with a fun sketch from 7 year old Nikolas. Great job Nicky! 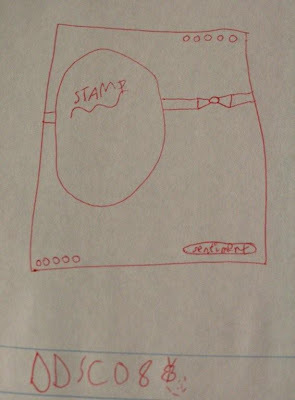 Here is the sketch.... And here's my card. I attended a baby shower this evening for a young lady who used to babysit my children, years ago. She's having her first...a boy. So, I figured I'd make a card for her and use the sketch challenge from our weekly Diedrich Dare. The paper piercing with the faux stitching got a bit too "thick" at one point, but I didn't have time to re-do it, so I figure...that's part of getting a homemade card (at least from me)....sometimes it's not perfect. If you'd like to play along, make sure and link your card using Mr. Linky on the Whimsical Wednesday blog, and use the key word DDSC16 so we'll know where to find you. Check out all the other wonderful works of the Diedrich Dare members. A few members can't play this week, many still out of town for Christmas visits, or just super busy - Cassie, Heather, Valerie, Debbie, and Jessica. Oh...and one more thing before I close...Starting in January, the Diedrich Dare will have sponsers and prizes. You can read more at the Whimsical Wednesdays blog...so stay tuned for more fun information. And here's what I came up with. I played around with this new Stampin' Up! set I just got...called Extreme Elements, along with the Extreme skateboarder. I think I like the Ballet Blue and white card better than the Certainly Celery and Ballet Blue card at the bottom...what do you think? I played around with some Stickles too, and a star punch. So, quick and simple, but appropriate for a guy. Make sure to visit the Whimsical Wednesdays blog for the details of a give-away, and to check out our feature Daredevil, Debbie, this week! And check out the wonderful works of the other Daredevils. Everyone is playing this week except Sandra...and we're sending lots of hugs her way. Have a great holiday week everyone! Hi everyone...Happy Wednesday! 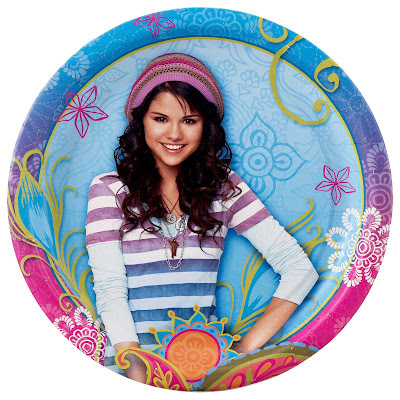 This week Madelynn gave us an inspiration challenge - this cute plate of The Wizards of Waverly Place. I'm not familiar with the show, but I guess it's popular now, and Madelynn found this fun plate for us to be inspired and create our cards this week. I'm sure all the Dare Devils will come up with fabulous projects (like always). Debbie isn't able to play, but check out everyone else's blogs - links on the right hand column. We have 2 new Dare Devils - Jacquie and Valerie. Welcome to the team gals! If you'd like to play along, make sure and let us know by adding a link to the Whimsical Wednesdays blog so we'll know where to find you. I have had fun making all sorts of Easel Cards since our easel card challenge a couple weeks ago. I used a Stampin' Up! retired set - "Doodle This" because I felt it had a whimsical fun feel - like this plate. I tried using some of the same colors (Lovely Lilac, Gable Green, Pink Passion and Orchid Opulence). I did some paper piercing for Jess (cause I know how much she loves it!!!). And you can't really tell in the picture, but there is stickles glitter on parts of the flower and around the pink edge. Here is a side view of the Easel cards. They're so much fun! The sentiment inside the card says "Laugh and the world laughs with you. Cry, and you cry with your girlfriends." True, true! I used the Big on Christmas set from Stampin' Up! It's a quick easy card, since it's another busy week of classes and a big holiday dinner I'm in charge of. I tend to make quick and easy cards....that's my life it seems. Check out the wonderful works of the other Dare Devils this week. Everyone is playing except Debbie, and we have a new Dare Devil...Kris. Welcome Kris! Happy Wednesday everyone, and Happy Thanksgiving! 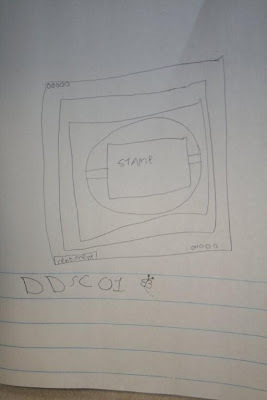 It's a busy week for card making, but we don't want to forget our weekly sketch challenge from the Diedrich kids; this week the sketch is coming from 7 year old Jack. Great sketch Jack! Here it is below: And here's my card. I'm in the finishing up stages of Christmas card making, and we actually have some possible snow in the forecast this week here in Chicagoland (ugh!) so I thought I'd play that up and create a card with a beautiful snowflake. This is the "Serene Snowflake" set from Stampin' Up! embossed in silver, with a litle bit of Stickles added. Check out the other Dare devils and their wonderful creations. Their links are listed on the right hand column. Also, there will be a prize this week, so head on over to the Whimsical Wednesdays blog to check out the details! Have a fabulous holiday week, and hope you have time this week to count your blessings. I know I certainly have lots to be thankful for. Happy Wednesday everyone! 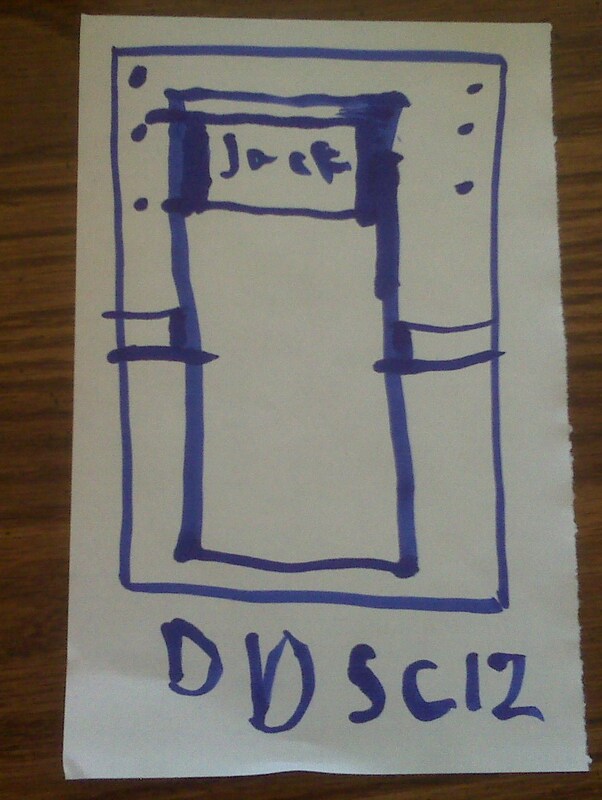 This week the Diedrich kids have challenged us to make a card using the new "Easel Style" which is the hottest new thing now. This was the first time I ever tried it, and I have to say, it's not hard and it's fun! It's a great way to display a card. I know there are directions somewhere out there - but Jess told me how to make them last week when I was in Tennessee, and I just did it without reading any of the directions. I used a fun new technique on this card that I'm pretty excited about too: You ink up the flat side of the Cuttlebug embossing folder with a brayer, put your cardstock in and run it through your Big Shot (or Cuttlebug) like usual, and waa laa...you have colored embossed paper with the raised swirl (or whatever design) that isn't colored. (Does that make sense?) I used Stampin' Up! 's "Plenty of Petals" embossing folder for this card. You can't tell by looking at the picture that it's embossed, but in person you can see the flowers raised up white, and the background red. Cool, huh? If you'd like to play along with us, upload your card to SCS or a personal blog and be sure and drop a note on the Whimsical Wednesdays blog and leave a link to your creation. And don't forget to check out the wonderful works of the other Dare Devils. They always do fantastic work. Their links are on the right hand column. This is so cool! I'm writing this post from Jessica's house in TN. We've had a great time together - doing some stamping, enjoying live country music, eating at the famous Loveless Cafe, finding treasures at the local scrapbooking store....we've had a grand time! I LOVE it here in Tennessee - it's BEAUTIFUL! I'm heading back to Chicagoland tomorrow morning. 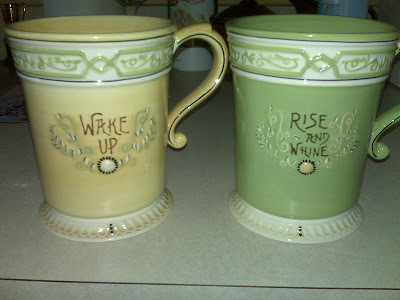 Here is our challenge for the week - an inspiration challenge of mugs. And here is my card - an actual "mug" card. Check out the cards of all the other Diedrich Dare members - I'm sure they've done excellent work like always. (I am lucky enough to see Jessica creating her awesome card IN PERSON!) Everyone is playing this week except Randi. We'll catch her next time. Have a great week everyone! Greetings from the lovely state of Tennessee! Here is a pic of Jessica and I at Good Morning America with Brad Paisley and Carrie Underwood. It was great music! Nashville is known for it's good country music! I'm in the midst of making Christmas cards, so I thought I'd continue that trend and make a Christmas card for this week's challenge. I used the Stampin' Up! set "Snow Swirled". And I wanted to add a little bling. So...enjoy! If you want to play along, you can upload your card to a blog or SCS and leave us the link on the Whimsical Wednedsays website so we can check out your card. Whimsical Wednesdays - the Diedrich Dare week 8! And here's my card. I love the beautiful colors of fall, and right now in Chicagoland the autumn colors are pretty much at their peak - maybe even a bit past their peak. So, I tried to capture a little of the autumn beauty in this card. I used the Stampin' Up! set "Autumn Splendor". This was the first card I made with the set, since I just got the set a couple days ago. I have lots of leaf type sets, so at first I didn't think I needed it. But then I saw a few projects that convinced me that I DID need this set. Check out the wonderful creations of the other Daredevils - I'm sure there will be some awesome cards this week (like always). Their blog links are listed in the right hand column. Debbie can't play with us this week. If you'd like to play along, you can upload your card to SCS or a blog, and link it to the Whimsical Wednesdays blog so we can check out your work. Our Dare Devil friend Cassie challenged us to do this little "Get to know you" quiz....using only one word! Hmmmm...fun and challenging. Thanks Cassie! So, here goes. This award comes with a survey that I have to fill out, and I can only use one word to answer the questions. Happy Wednesday everybody. It's another week and another dare by the Diedrich kids. Madelynn gave us a fun sketch this week, and I decided to do a fall card, since we're right in the thick of fall here in Chicagoland. The sketch almost looked like another round card, but I don't do so well with round cards, so I just decided to round the corners instead...maybe that's cheating a bit...lol. And here's my card. It's a pretty simple card - it seems I'm always preparing for classes lately - I had a stamp-a-stack class last night, so I haven't done really fancy techniques lately. But...it's done. Hope you have a wonderful autumn day Wednesday! Check out the wonderful works of the other Daredevils. Thier blogs are listed in the right hand column. Debbie isn't able to play this week, so we'll catch up with her another time. Check out the wonderful creations of the Daredevils - their links are in the right hand column. This week Cassie and Debbie aren't able to play. Head on over to the Whimsical Wednesdays blog - there is a prize offered this week! And here's what I came up with. Now, I know it's a little early to think about snowmen, but today was a chilly day here in Chicagoland. And...I've been working on Christmas cards lately (you've gotta start early if you make 150 cards!) and so I've got snowmen and holiday stuff on the brain. I used a retired set called Cold Play to come up with this smore snowman. Looks tasty, huh? Check out what wonderful works of art the other Daredevils have come up with. The links are in the right hand column. This week Debbie and Sandra are unable to play, so you'll have to wait till next week to see their fabulous creations. 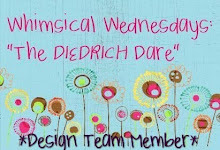 Whimsical Wednesdays - the Diedrich Dare week 3! Hello Stamping friends! I hope you are all having a wonderful autumn day. 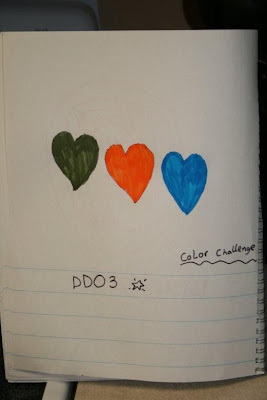 The Diedrich Dare challenge this week was a color challenge. It's another busy week for me - so this is another quick card. I guess I'm a quick card type of gal because I always seem to be busy preparing for classes, projects, etc... So, I decided to use the new "Pumpkin Patch" set from Stampin' Up! I love jack-o-lanterns and this is a great set to build jack-o-lanterns to your heart's content! The style of card is called a "Buckle card" because you slide the tab into the slot like a buckle and it keeps the card closed. Such a fun style of card. If anyone wants directions, let me know and I'll send them to you. I used just the tiniest bit of the blue, because I wanted this to be a pumpkin-ish card. Check out the fabulous works from the other Daredevils - links listed in the right column. Week 2 of our Diedrich Dare challenge was a little more 'challenging' shall we say. 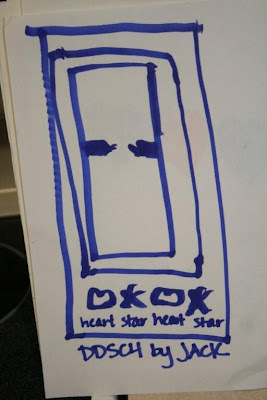 I haven't made many shape cards in my life, so this one stretched me. Combine that with not much time, and you get a quick, simple card. But, it was fun to do something different than the traditional rectangle card. Thanks for helping us grow, Miss Madelynn! I used Stampin' Up! 's Thoughts and Prayers set. The color combo is Pale Plum, Perfect Plum, Mellow Moss, and Always Artichoke. Check out the other wonderful creations from the Diedrich Daredevils...listed in the right hand column. A new start - the Diedrich Dare! 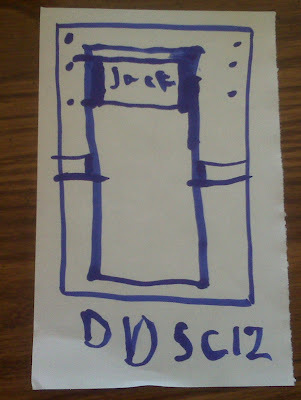 9 year old Madelynn and her 7 year old brothers Jack and Nick are starting a new Design team called "Whimsical Wednesdays - the Diedrich Dare." Fun, huh?! 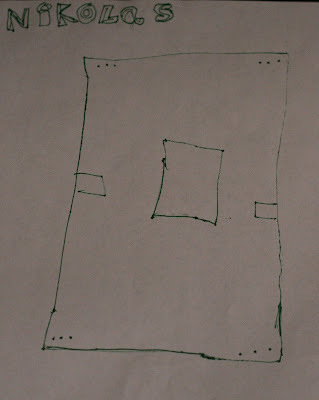 They will take turns designing sketches for the team to follow and create wonderful works of art. Above is the first sketch from Madelynn, and below is my interpretation of the sketch. This was a fun sketch - great job, Madelynn! Check out the other team members blogs with their creative ideas - the links are in the right hand column. I used the Stampin' Up! set called Falling Leaves, and some fun fall colors (Pumpkin Pie, More Mustard, Old Olive and Really Rust). I love autumn, so this set is a fun one for me to use. Have a happy autumn day! Just a quick post here - Madelynn and her mom have decided to take a little break from the weekly Twinkling Tuesday challenges during the summer. Life has been busy for a lot of the team, and Jessica and family are moving to Tennessee tomorrow. I'm happy for them, but will miss seeing Jess here. 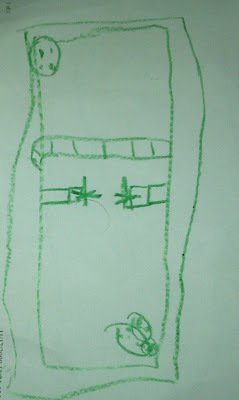 Wow...check out the challenge sketch that Madelynn gave us this week! This was a tough one for me. I tried a few different cards before I finally came up with this little "cute as a bug" card. I can just imagine her giggling as she was sketching away... wondering how we were all going to handle this sketch. If you are interested in purchasing this wonderful set, visit Jessica's Whimsical Butterfly blog for further details. (Link on the right hand column). Hi everyone - I'm posting later in the day than normal, and it's a quick card and quick post this week. BUSY week! 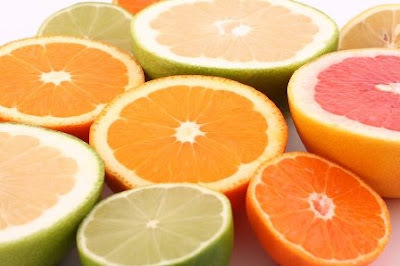 Madelynn's challenge for us this week is an "inspiration challenge" - with these fun, citrus fruits as our inspiration. I wanted to use a new set that is being released tomorrow by The Greeting Farm, so I tried to work it into the challenge. This fun new set - "Butterfly Wishes" is created by my good friend Jessica Diedrich - Madelynn's mom. She came up with the sentiments, and even drew the butterfly (with a bit of help). Isn't it awesome? You can click on her Whimsical Butterfly link (in the right hand column under the Twinkling Tuesdays team link) to find out all the details of how to order this awesome new set. Have a great Tuesday everyone, and enjoy the summer week! The UPS man finally delivered the new Stampin' Up! "In Colors" goodies (and new hostess set) to my door today. I had fun playing this afternoon - and decided to use these colors for my Twinkling card of the week. Madelynn's challenge for us this week was to use Rhinestones on our card. What a fun challenge! I decided to even add a little bling while I was at it! These cute cupcakes are from the new Hostess Level 2 set called "The More the Merrier". I used the new "In color" markers (YEAH!!) 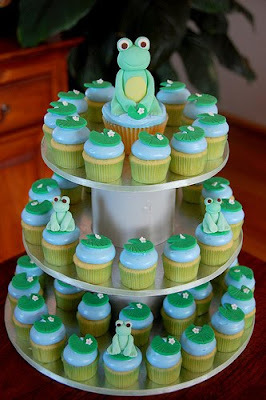 to color in the cupcakes - and added a little Stickles. The card base is the new "Melon Mambo". The cirlce layers are Melon Mambo and Rich Razzleberry. Such fun names! The new colors this year are all beautiful! I hope you have a wonderful Tuesday and that you have a happy summer week. Madelynn's back with another fun sketch this week. Here it is... and here's what I came up with. Madelynn's back with a fun sketch for us this week. Great job Madelynn! Here it is.... and here's what I came up with. MTTSC25 - Twinkling Tuesday time! This weeks challenge was an "inspirational challenge" instead of having a sketch to follow. Rebecca's son Jameson is our guest sketch man. 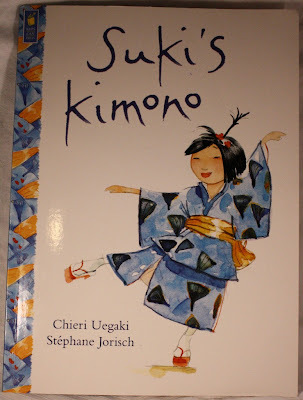 Rebecca sent us pictures of a book about a girl with a new Kimono - with the beautiful artwork as our inspiration. The picture above my card is the picture I focused on. The first thing I thought of was origami, so I made this flower using the Dhalia fold. Isn't it fun what you can do with folded paper? Life is a bit hectic right now with the end of school, so I didn't have lots of time to spend on it - so it was quick and simple...always a nice combination! Check out the other creations of the gals on the Twinkling Tuesdays team! Happy stamping! We made the following cards at my stamp-a-stack class this week. We made 2 of each card. Coloring with markers is a great idea with this set. Such a fun idea...popsicle card! I cased this card from many other samples I've seen on the internet. I've been a Stampin' Up! demonstrator for 11 years now. I love the creativity it brings in my life, and I love sharing it with others. Designed using elements from Rhonna Farrer. Thanks to my good friend Ferrill, for designing this for me! You're awesome! Stampin' Up! 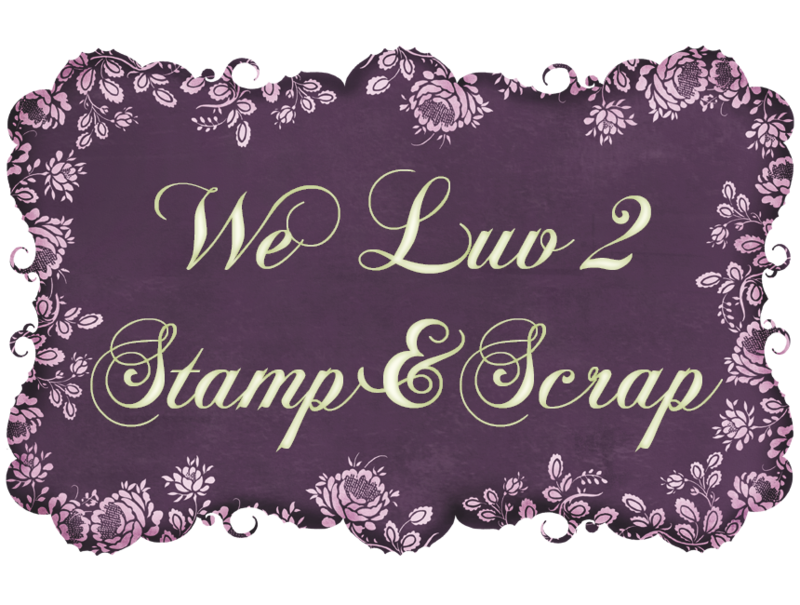 wants me to mention that the content of this blog is my sole responsibility as an Independent Stampin' Up! 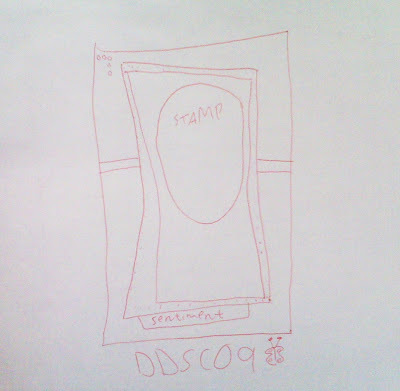 Demonstrator, and the content of classes, services or products offered on this blog is not endorsed by Stampin' Up!